You (or your family members) have issues with pets allergies. You must be tired of cleaning the dog and cat hairs all time. Your family don’t like the odors and smells (admit it, no one like) of your pets. So stop letting yourself (and your family) be desperate from all of these situations. It’s time to find a best air purifier for pets in 2019 to clear all your problems at one. UPDATED: We have updated our list of best air purifiers for pets (dog and cat dander, hair and odor) in 02/27/2019. In Breathe Quality, we keep updating our posts whenever possible, and this update is the result of a 3-month consecutive experiment in our labs, so we can make sure that you will get the right air purifier for your dog hair, dog smell and cat allergies problems. Our next update will be set for 3-6 months later, depending on the release of new products from the well-known air purifier brands. However, you don’t need to wait, because the air purifier market will never change so quickly. We do not (never) exaggerate one product just to let you click the links and buy that product blindly. Of course, we always love our pets, but we also need to love ourselves. 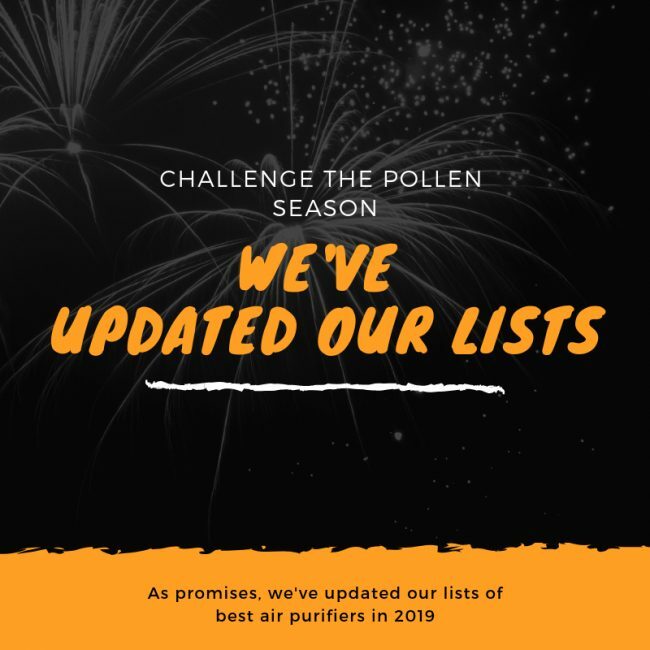 We hope that, as usual, our list will help those in trouble find the best air purifiers they deserve to have, and live a happy life with their own pets. To do that, we test these air purifiers rigorously, making sure that we check every angle and feature – but most importantly, experience in real-world use whether the air purifiers have a strong performance, powerful fan and low power consumption. This Comparison Table of best air purifiers for pets will help you have a quick overview of our list of Top 10 Best Air Purifiers for Pets (Dog & Cat Dander, Hair and Odors) in 2019. The factor for comparison in this table is the Filter Types of this air purifier, also we give the most concerned factors as Room Coverage and a link to the Annual Filter Replacement. Remember that you should check the reviews of this comparison table. We will share all the knowledge about the pros and cons of each air purifier to help you understand why we choose these 10 as the best air purifiers for pets in 2019. Previously in our list: Winix WAC9500. Through our in-depth review process, the first place of the best air purifier for pets is changed. We have to say goodbye to the previous Winix WAC9500, one of our best air purifiers in 2018. And welcome the new Champion – the Winix HR1000. Though not being the most expensive air purifier, the Winix HR1000 is definitely the best device come out of the Korean brand, with tons of high-end features and a more powerful fan. Seriously, there isn’t another air purifier out there with much features at such low price as this. The highlight of this Winix HR1000 against all types of pet problems and pet allergies is as below. What made the Winix WAC9500 the best air purifier for pets last year, once again is the unique selling point of this Winix HR1000. The 5-stage air cleaning system, with the core is a combination of a tier-one True HEPA filter and PlasmaWave technology, allows the Winix HR1000 to remove and destroy 99.97% of any particles that your pets are shredding into the air. The particulate matter is down to 0.3 microns, meaning any pet hair and pet dander that trigger your pet allergies will disappeared. The True HEPA filter from Winix HR1000 not only capture the tiniest pollutants, but it also lasts longer without cleaning thanks to the Anti-Microbial Coating – which covers the True HEPA filter and prohibit the growth of microbes and bacteria. This feature is only available on the latest air purifiers of Winix. To guarantee that you will no longer live with pet allergies, the Winix HR1000 features the unique PlasmaWave technology, that emits electrical discharge to create dual polarity ions (positive and negative) and disperses them into the air. As the ions attach to the surface of air pollutants, such as bacteria or viruses, they naturally remove hydrogen from the molecular structure of air pollutants, thus eliminating them and resulting in cleaner, fresher air. The pre-filter of Winix HR1000 is washable and permanent to help you trap the airborne pet hair. Also, with the Coated Deodorization Activated Carbon filter, Winix HR1000 can offer 97% protection against any types of pet odors, smoke and even Volatile Organic Compounds (VOCs). And the performance rating will greatly increase thanks to a more powerful fan of Winix HR1000, with CADR of 264 Dust/ 258 Smoke/ 301 Pollen (cfm). Smart Sensor is here, as is exceptionally good sensor. With this sensor, you don’t need to control your air purifier anymore, as Winix HR1000 automatically detects the indoor air quality, feedback to the users and adjust the fan speed to deal with the volume of contaminants. So, just set it and forget it, you can play with your pets without worry anymore. And finally, the Smart Wifi function. You need to turn on and off your air purifier from a distance, but don’t remember where you put the remote control last night. But who can forget their smartphones? Just download the Winix Smart App, and you can control your Winix HR1000 without hassle. Previously in our list: Hamilton Beach 04384. Picking a $50 air purifier in a list of best air purifiers for pets is really, really difficult. Though the air purifier market is in rapid innovation, the air purifier device still needs a high-quality air filter (not just the cheap and useless paper filter) and at least decent fan power to work efficiently. There is only a few air purifiers that’s worth to invest under $50, otherwise you will waste money on some garbage which won’t last long. Then we have the Hamilton Beach 04384, a device which can deal with all your pet allergies for the lifetime. Of course, it isn’t one high-end device, but we are mentioning an awesome value-for-money to buy. If pet dander is not much of your concern, but the pet hair and pet odors are, then Hamilton Beach 04384 is perfect for you. Hamilton Beach 04384 uses a Permanent HEPA-type Filter that can be cleaned with a vacuum cleaner. 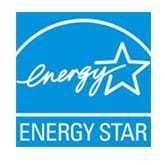 With much proper care, you don’t need to pay for at least $49 a year versus comparable HEPA replacement filter. In real-world use, and from lots of verified reviews in Amazon, the Hamilton Beach 04384 can capture 99% for PM 2.5 particles. One thing we must warn you, the HEPA filter is not washable. You must use the vacuum cleaner to remove the pet hair and dust on it weekly, or else it will decrease the performance. If you’re simply after the solution for your pet odor, the Hamilton Beach 04384 is the one to get. 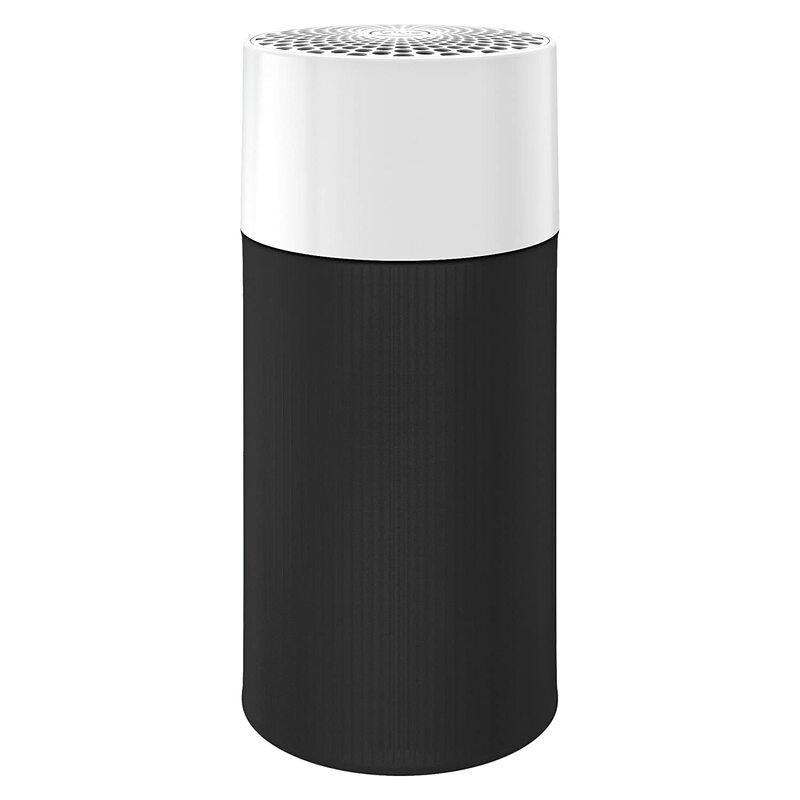 This air purifier has 2 Activated Carbon zeolite Filters, which is great against any odors from your dogs and cats. Review: Hamilton Beach 04384 Review. Do you prefer a budget device from a well-known brand? Blueair is a giant in air purifier industry for more than 20 years. We can find their air purifiers anywhere in the world, from the hospitals, the meeting halls, the schools and even in our friends’ homes. We imagine of their air purifiers as the big and bulky machines, but we don’t know that Blueair has one ace in the budget segment – the Blue Pure 411. For every pet problem of yours, this Blue Pure 411 can eliminate quickly. The Blue Pure 411 makes use of a certified Particle filter, instead of using the True HEPA filter. Thanks to the HEPASilent technology, Blue Pure 411 combines both the mechanical and electrostatic filtration to make sure it can capture 99% of down to 0.3 microns particles. For approximately 75% of cat dander particles are 5 to 10 microns and 25% are 2.5 microns or smaller, this Blue Pure 411 will solve your pet allergies without any troubles. To trap pet hair, fur or/and feather, Blue Pure 411 has an external pre-filter, to help you know the real-time status and wash it as soon as possible. This pre-filter can also help extend the life time of the Particle filter as well as improve the efficiency. 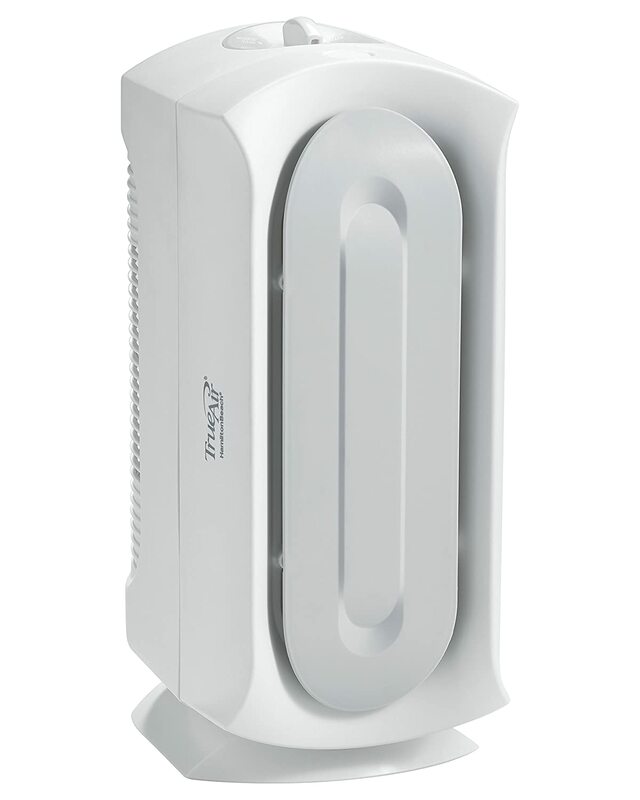 However, Blue Pure 411 has a great downside for being a budget air purifier – the fan power. It has a capability of only 161 sq ft. On the other hand, the low fan power makes this air purifier quiet and energy-saving. 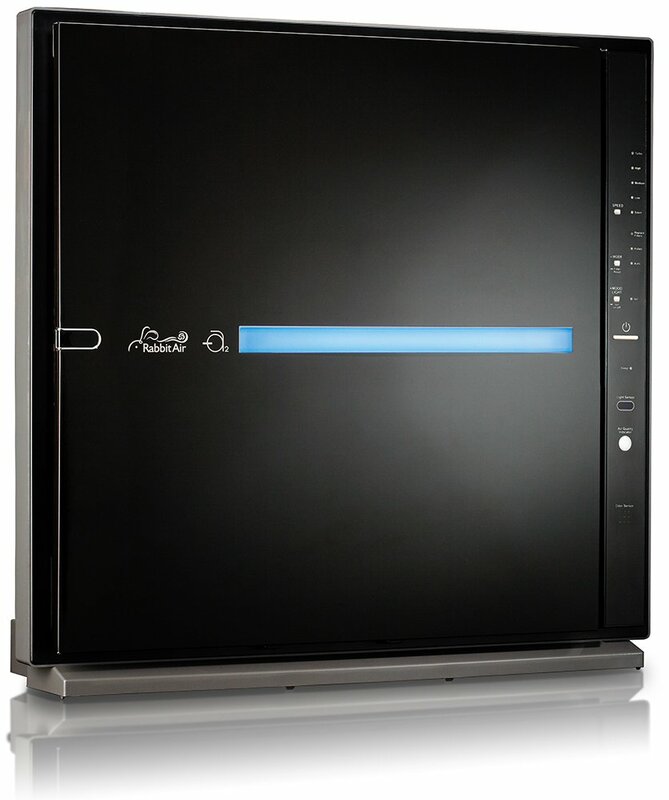 Blueair has confirmed that their Blue Pure 411 uses less energy than an average LED light bulb. Previously in our list: GermGuardian AC5250PT. It is not a surprise when you see a GermGuardian air purifier in any list of best air purifiers, especially in the list of best air purifiers for pets. For an affordable price, we highly recommend GermGuardian AC5250PT – one of the Amazon Best sellers. GermGuardian AC5250PT improves upon its predecessors with a new Pet Pure Treatment technology to optimize the performance of its True HEPA filter. The new air filter still can capture 99.97% of allergens as small as 0.3 microns such as household dust, pet dander, mold spores and plant pollen, but will also resist against the growth of bacteria on its surface. Such high-quality feature in a $100 air purifier is unbelievable. The UV-C Light filter is the signature feature of all GermGuardian’s air purifiers, to destroy even the smallest bacteria and viruses in the air. With this powerful combination, you won’t need to live with your pet allergies anymore, all thanks to GermGuardian AC5250PT. Only one downside, the Activated Carbon filter is attached to the pre-filter. By doing so, you need to replace the pre-filter quite regularly (about 7-8 months). That means you need to replace the whole internal air filtration system annually, and believe me, the cost is really high. Guardian Technologies is famed for their low-priced and highly competitive air purifiers, as the GermGuardian AC5250PT is not the only budget device to buy. With the same performance, you can look for these Amazon’s Best Sellers as well – the GermGuardian AC4825 and GermGuardian AC4300BPTCA. They are all under $100, with the same internal air filtration process as this GermGuardian AC5250PT. Or else, you can check the modern devices – GermGuardian CDAP5500BCA and GermGuardian CDAP4500BCA. You will have the high-end features like Smart Sensor and Wifi connectivity function when using these air purifiers. Previously in our list: Biota Bot MM208. Honeywell series has long been the best True HEPA air purifier with powerful fan and that continues (and shines) with the excellent Honeywell HPA300. More than 25 years in this industry, there is no Honeywell air purifier could reach the same success as the Honeywell 50250 like the powerful Honeywell HPA300. Without any Smart features, the Honeywell HPA300 is still the top pick simply because of its reliable and wonderful performance. 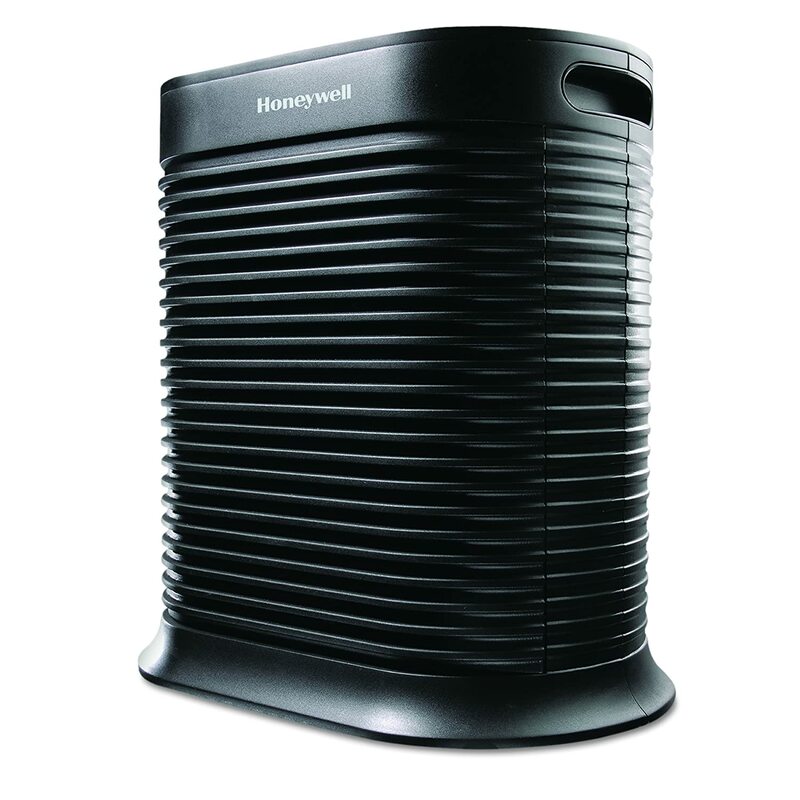 Honeywell HPA300 has only a 2-stage air cleaning system, but the standout feature is its True HEPA filter. This air filter can capture an astonishing 99.97% of airborne particles at 0.3 microns, and even the 0.005 microns viruses. That’s why we called the Honeywell HPA300 True Allergen Remover. You will immediately feel the difference in air quality after running this unit in just 10 minutes. One prominent feature from this Honeywell HPA300 is the unmatched fan power. For a $200 air purifier, Honeywell HPA300 has high CADR of 320 Dust/ 300 Smoke/ 300 Pollen (cfm). This CADR is higher than even the $600 Rabbit Air MinusA2 or $650 Honeywell HPA600B. We don’t imply the CADR rating to indicate the performance of one air purifier, but with such high CADR, Honeywell HPA300 will clean all your pet allergens really quick. But, just like the aforementioned GermGuardian AC5250PT, you need to replace the pre-filter because it is attached to the Activated Carbon filter. This will bump up the annual filter cost for the Honeywell HPA300, especially when you need to change the pre-filter once every 3 months. Today, it is hard to miss the influence of Levoit LV-H132 if you are ready to buy an air purifier. The device itself is a phenomenon, with sleek design and beautifully low price. 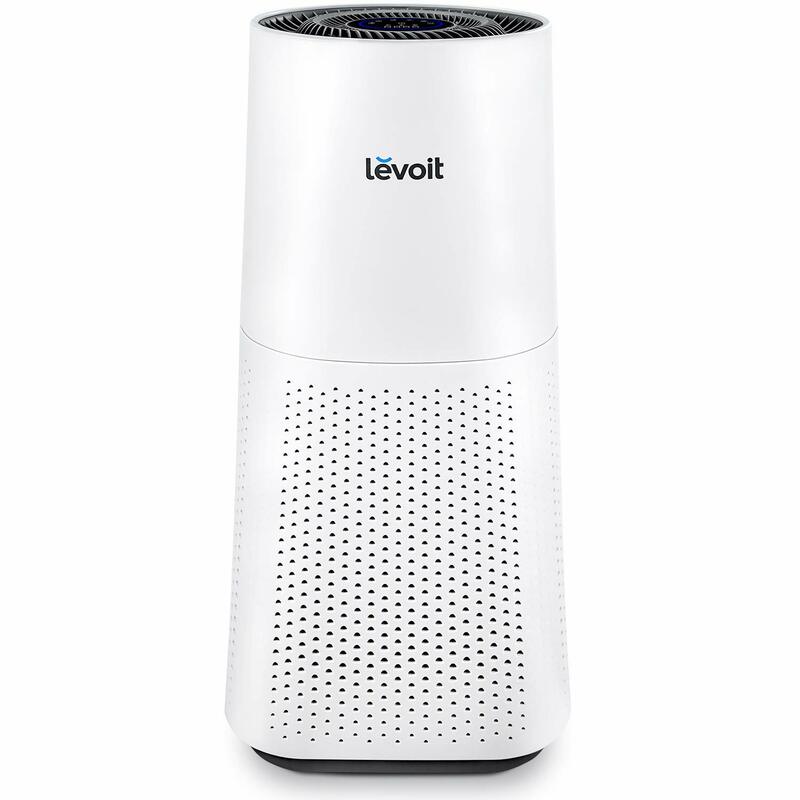 But it seems Levoit just uses the compact air purifier as a start for more premium devices. The Levoit LV-H134 is exactly the attempt this company make to dominate the mid-range market, which we need more time to have the answer. However, for everyone’s pet issues, the Levoit LV-H134 is truly prominent. The latest True HEPA filter from Levoit LV-H134 is more sturdy built, that can help neutralize 99.97% of as small as 0.3 microns allergens, including of pet dander. To combat against the pet odor, this air purifier contains lots of Activated Carbon inside the air filter. With big size, the Levoit LV-H134 will impress with its high fan power, with CADR rating as high as 312 cfm in general. For the price, this air purifier can cover a large room of 710 sq ft with ease. We have tested the performance of this Levoit LV-H134 against two cats and one dog in our lab, and of course, we never experience the pet odors or the common cat allergies from even the most sensitive people. As for the Smart Sensor, this is one of the most accurate sensor we’ve ever seen. And don’t forget the convenient Sleep Mode, which keeps the air purifier operate at the lowest setting for your night time. For us, the Oransi Max was the best Oransi’s HEPA air purifier for pets in 2019. It offers the high-quality performance and impressive fan power but at a price that’s a bit easier to stomach than the Oransi Erik 650A and Oransi EJ120. For a common brand with some of the leading companies, medical centers, government organizations and universities, such as Google, NASA and even the American Red Cross, it is not so hard to understand why the Oransi Max is one of the Amazon’s Choices today. With the combination of the True HEPA filter and the nano piezo-electric ions, the Oransi Max can effectively remove 99.97% pet dander allergies, pet hair, mold spores, dust mites, pollen, allergens and other solid particles. Even the airborne impurities as small as 0.1 microns won’t escape this powerful True HEPA filter. Moreover, Oransi added a seal around the filter to ensure the air does not by-pass the HEPA filter. So to say, you will only breathe the fresh air, without pet dander and pet hair. Oransi Max has 3 lbs of specially treated Activated Carbon in the removal of cigarette smoke and stronger odors like pet odors. This Activated Carbon is so strong as it can even deal with the chemical gases, wildfire smoke and other gases. Pet odors will never be a trouble anymore. Just like any other high-end air purifiers, the Oransi Max makes use of an accurate Smart Sensor, to give you a visual sign of the indoor air quality in your room, as well as automatically adjust the fan speed depending on the air quality reading of the air pollutants. Note that the Smart Sensor needs to run for the first 10 minutes in order to warm up and calibrate. Capping off an impressive 2018 for Rabbit Air, the Rabbit Air MinusA2 is once again the candidate of the list of best air purifiers for pets. This air purifier is a masterpiece that packs an inordinate amount of features into its sleek body. With such top-notch air filtration system, the Rabbit Air MinusA2 is the luxury mid-range air purifier you can get to deal with your pet allergies and pet problems. Rabbit Air MinusA2 runs with not 2 or 3 stage of air filtration, instead you will be amazed with its 6-stage air cleaning system. First, any allergens need to pass through double the preliminary filtration, which makes sure to capture any types of pet hair, fur or feather. 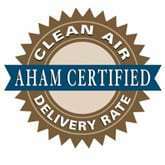 Next, our main compliment, is the Advanced BioGS HEPA filter, which is a certified True HEPA filter to capture 99.97% of down to 0.3 microns allergens like pet dander, virus particles, pollen, mold and fungi particles. But due to the Advanced BioGS technology, this HEPA filter can last for at least 2 years without replacing, efficiently reduces the annual filter cost. Also, with the combination of an ionizer, the performance of this Rabbit Air MinusA2 is enhanced further. If you have extreme allergies with your pets, or you can’t stand the pet odors anymore, you can choose between the Pet Allergy or Odor Remover for the Customized Filter of this Rabbit Air MinusA2. These air filter are specially engineered and designed to improve the removal against some specific irritants. Don’t forget that Rabbit Air MinusA2 is currently the best air purifier in 2019, so it will feature the high-end features like Smart Sensor or Smart Wifi connectivity. We guess that you don’t need a reason to know why you need these modern features, right? Alen’s newest BreatheSmart air purifier is finally a True HEPA device. Now the Alen BreatheSmart 75i has a boost in both performance and air filtration process, as well as an already strong customer service to back up. So, is there any reason to hold you back from choosing it as the best air purifier for pets? For every pet allergies problem, you just only need the exact Pet HEPA from Alen BreatheSmart 75i. Not only it is a True HEPA filter to capture 99.97% of as small as 0.3 microns pollutant particles such as pet dander, pet hair and other allergens, it uses the Alen’s patented Molecular Conversion Powder to ensure heavy pet odors are destroyed at a molecular level. Alen BreatheSmart family used to have weak fan power, but that’s not in the case of Alen BreatheSmart 75i, as the flagship of this company can operate with high CADR of 347 cfm overall. With such high fan power, this air purifier will clean your pet allergies problem within minutes. There is no need to explain more about the Smart Sensor. Instead, you should look at the incredible customer service of Alen, which allows a Forever Warranty. So to say, you have the absolute confidence when buying the Alen BreatheSmart 75i to deal with your pet issues. Since 1990, Austin Air has been the most well-known brand in American air purifier market. They are featured in medical and health newsletters including Dr. Whitaker’s Health & Healing, and also selected by the U.S government to help protect the residents of Anniston, Alabama during the elimination of chemical weapons. With such strong foundation, there is no doubt the Austin Air Pet Machine is the ultimate solution for all your pet troubles. This Austin Air Pet Machine is designed specifically for customers with pets looking to remove unwanted odors, pet dander and animal allergens from the home. To do that, just like any air purifier machines from this company, Austin Air Pet Machine uses double the pre-filtration to remove most of the pet hair and pet dander in the air. The next stage is the powerful Activated Carbon filter, with specially Impregnated Carbon and Zeolite, to neutralize the ammonias, pet odors and dander, chemicals, and gases. Finally, any pet allergens must face the 60 sq ft Medical Grade True HEPA filter. With this size, the Austin Air Pet Machine can capture 99.97% of all particles as small as 0.3 microns and 95% of all particles as small as 0.1 microns. That’s the smallest level of allergens, and you will feel the difference immediately. Review: Austin Air Pet Machine Review. If you still have doubt of why you need the best air purifiers for pets, you should take a look now. If you are reading our article of Best air purifiers for allergies and asthma, you’ve already known that more than 50 millions Americans suffer from allergies each year (according to AAFA – Asthma and Allergy Foundation of American). With 65% of US households own at least one pet, no wonder why more and more people are looking for a solution to live with their pets. Let’s look at the problem of your pets. Your pets (which are cats, dogs and any other types of pets), each day, will loose in the air a huge amount of hair, fur and feather. Those things are visible to human’s eyes, however, are not the reasons for pet allergies. The truth is, the pet dander behind all these hair, fur and feather you see. The issues you get from pet hair is when you clean the floor or your furniture. Moreover, though it doesn’t cause allergies, your pet’s odor is sometimes extremely bad for your nose. Pet dander gets worse as your pet gets older. They will tend to shed more and more. That’s why people with pet allergies notice an increase in their symptoms. If you are a pet owner, it is a best bet that you need an air purifier. To save your time of researching, we create a list of best air purifiers for pets in 2019 (so you won’t get outdated air purifiers). If you are an pet owner who (or your family members) suffer from a pet allergy, since this problem is really serious, you should purchase for the best air purifiers available in the market. We highly recommend you to read these best air purifiers for allergies in 2019, we have listed all the top rated air purifiers to combat with the allergy pollutant particles. Important Note: The best air purifier to help remove the tiniest particles of pet dander need to have True HEPA filter. The reason you want an air purifier with a True HEPA filter is that it’s the only one certified to remove 99.97% of allergens as small as 0.3 microns. This includes all types of pet dander, from every kind of animal. Things are trapped in True HEPA filter won’t get out to the air again. Running your air purifier 24/7 helps you the most with your problem of pet allergies. The problem with pet hair, fur and feather is much easier. Those visible things are too large to be capture by just an average air purifier, so you won’t need to spend lots of money for a True HEPA filter air purifier. The best air purifier for pet hair only will have a “HEPA-type filter”, or “HEPA-like filter”. For the high-end air purifiers, you should look for an air purifier which has washable pre-filter. Because these filter will almost last permanently, these air purifiers are the most reasonable things to buy. Related post: Do air purifiers get rid of pet hair and pet dander? The only filter can help you absorb odors (as well as other chemicals and smoke) is Activated Carbon filter. Activated Carbon air filter (many brands just call Charcoal air filter) uses a special form of activated carbon that consists of millions of tiny absorbent pores, to absorb and neutralize volatile chemicals on a molecular basis (for example harmful gases, odor, VOCs and some chemicals). If you (or your family) have pet allergies, find for True HEPA filter Air purifiers only. If you need to remove pet hair or feather, look for a washable pre-filter or a Permanent HEPA filter. If you hate your pet odors, check the air purifiers with Activated Carbon (or Charcoal) filter. Related post: Do air purifiers remove odor? Even without the dangerous and annoying pet allergies, you will have trouble with cleaning your dog hair or cat dander often. Not only removing animal fur and allergens, these best air purifiers for pets are also great at collecting dust and dirt particles as well. And the more time you run your air purifier, the less time you spend for cleaning your home. Your air will be fresh, without your dog and cat smells and odors. Cats are typical free-roam ones, but only live indoors. And if you are a dog owner, you will know how bad the dog smell is. The situation is much worse when you keep the indoor-only pets like hamster, pig or birds… Of course it is recommended to regularly clean the cages or pans of these animals, but it is better to have a solution to keep fresh air as soon as possible. Hopefully, this list and guide has helped you understand more clearly why an air purifier is a great investment if you own pets, as well as help you make the right decision on which product to choose. The best air purifier for pets in 2019 listed above are your top and safe options as a pet owner and should serve you well for a lifetime of use. Thank you!